The previous post was an introduction to ship systems. In this one, I’d like to talk about the thought process and decision making that went into the design. There are many ways to do things, and I’m not claiming that the way I ended up going about it is the best. Nonetheless, looking at the dev build so far – the results seem promising, and I hope you’ll find the process interesting. Besides, it’ll help me to put this down in writing, and then go through the ship systems again, with hopefully greater clarity of thought – so, you’re stuck with this being the subject of the blog entry. Might as well grab a beverage of choice and settle down for a long read. A brief reminder: a ship system is an active ability, something a ship can do – teleport, engage afterburners, use flares, etc. A system is specific to a hull, and can’t be customized the way weapons and hull mods can – the goal is to make each ship have more uniqueness and flavor, as well as play differently. Using a ship system is an action you decide to take, and it’s important for that decision to be interesting. What “interesting” means is subjective, but I think it’s reasonable to say that if it’s obvious (also subjective – what fun!) when to use a system, then the decision-making process is too simple. For example: if you had a system that instantly got rid of all of the ship’s flux, and could be used on a short cooldown – but otherwise freely – you’d want to use it every time your flux is right around maxed out. So, what could we do with a system like that to make the decision process more interesting? The system could have a longer cooldown – if you use it now, you might not be able to use it a little later, when you really need it. I don’t like long cooldowns, though. In practice, the player will use the ability much less often, waiting for the perfect moment – or holding it in reserve against a bad situation that, if they play well enough, might not happen at all. And really, if I’m going to spend time developing ship systems, I’d like them to see more use, not less. The system could have a limited number of uses. Even if it’s not so low as to require hoarding until the perfect moment, that’s still not much better. We start off with it being formulaic (enough uses not to worry about running out – use at “obvious” moment) and progress to hoarding when the number of uses goes down. Going from one type of bad to another – but still, it’s more interesting during the transition. What about something completely different? Let’s say that using the system disables your shields and makes your ship take extra damage during the next few seconds. Now we’re talking! All of a sudden, you have to look at the tactical situation to see if using the system is a good idea – and, better yet, using it will influence your actions in the near future. You’ll want to keep out of trouble, but at the same time, since you’ve got all this flux to burn on weapons, you want to engage any particularly vulnerable targets. This system was purely hypothetical, but I think we can draw a reasonable generalization from examining it: Downsides to taking an action are more interesting than limitations on being able to take an action. (You could say that the downside of a cooldown is not being able to use the system for a time – technically, that’s correct, but let’s not go there. Before long, we’d start arguing about the meaning of “is”.) The point here is that a downside opens up a new dimension of gameplay, where a limitation closes down an existing one. Unless the limitation is something that comes from within the gameplay (“you have to be behind someone to backstab”) vs outside it (“backstab is on cooldown, sorry”). Does that mean that cooldowns, limited uses, and all such shouldn’t be used? They’re still useful balancing tools, and can meaningfully play into the decision-making process – but we shouldn’t rely on them to make mechanics more interesting. It’s ok to have a short cooldown to balance out a perfectly good skill that becomes game-breaking if it could be used every frame, for example. I’d be worried about abilities that rely on lengthy cooldowns to counterbalance their effectiveness, though. Another aspect of a good ship system is that it’s satisfying to use (once again, subjective). I think this comes down to lots of playtesting, tweaking, and some more playtesting. The impact the skill has in the game, the graphics, the sound effects – all of these play into it. 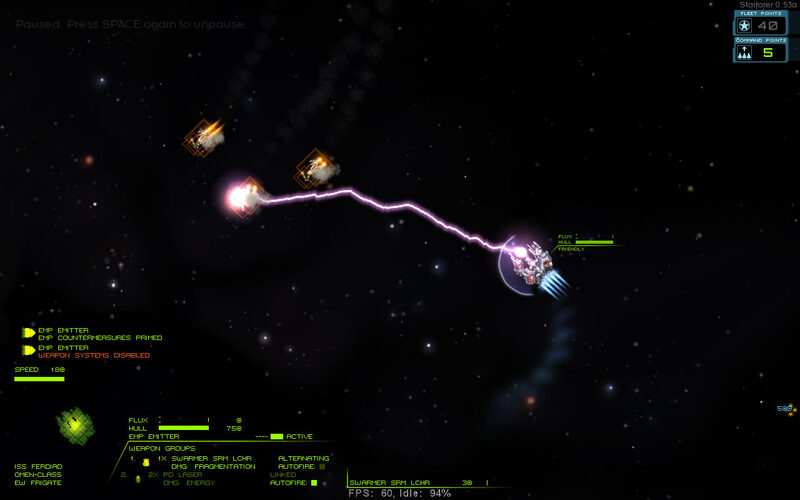 Actually having unique visual and sound effects is critical – the player has taken the trouble to make a decision and press a button, after all, so they should see something happening on the screen. It’s also important to be able to tell what enemy (and allied) ships are doing. I don’t have much more to say about this, though it seemed worth mentioning because it’s such an important aspect – but in the end, it just takes time and iterations until it feels right.